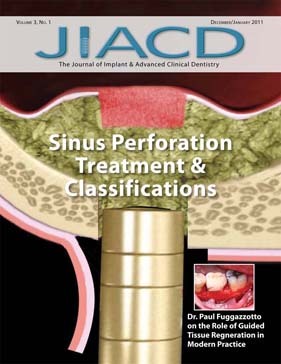 The Journal of Implant and Advanced Clinical Dentistry (JIACD) was founded by a pair of board certified periodontists who shared a vision of combining traditional peer reviewed dental literature with twenty first century multimedia technology. As the world's first truly interactive paperless dental journal, JIACD provides its readers an experience that is simply not available with traditional hard copy paper journals. JIACD strives to provide the dental profession with peer reviewed original research, authoritative reviews, clinical techniques, and expert commentary pertinent to modern clinical practice. The JIACD editorial board, composed of some of the most respected names in dentistry, ensures that JIACD articles are of paramount quality and contribute to the advancement of our profession.